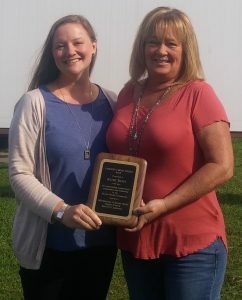 Kathy Raney, Recovery Services Coordinator with Centerstone’s Health Home program, was recently awarded the Carleen Cross Award at the Region Five 22nd annual Recovery Conference on August 9 at John A. Logan College in Carterville, IL. The award was created in 2012 to recognize Carleen for her commitment, compassion, and leadership in the mental health community. Carleen passed away from cancer in 2011. Since 2012, the Recovery Conference Committee has honored an individual who displays outstanding leadership and advocacy for mental health and is active in the receovery movement in the Region Five South area, including the following counties: Crawford, Jasper, Richland, Edwards, Clay, Clinton, Wayne, White, Wabash, Saline, Marion, Jefferson, Jackson, Franklin, Williamson, Massac, Johnson, Union, Pope, Fayette, Perry, Pulaski, Washington, Hardin, Hamilton, and Alexander. Raney has served on the Recovery Conference Planning Committee for several years. Raney was nominated by Johanna Wichmann, Health Home Clinical Manager for Centerstone. Raney has worked with Centerstone and its legacy organizations for a quarter of a century. Wichmann said she is motivated by Raney and her work in the ACT program. ACT is an integrated, self-contained, evidence-based treatment program based on an intensive, multidisciplinary, team-based community treatment using home and community visits as the primary mode of intervention. ACT is designed to prevent institutionalization (jail or hospital) or homelessness. The multidisciplinary team works collaboratively with the person served and family members. The ACT team includes a team leader, a psychiatrist, a registered nurse, a rehab specialist, a vocational specialist, and an addictions specialist. “Kathy worked on our ACT team from her start with this agency more than 25 years ago. This is a very intensive and difficult to engage population, one that most people burn out on long before 25 years. Not only did Kathy stick with it, but she worked with many of the same clients from day one to her last day on the ACT team in March of 2018 (when Raney was promoted to Recovery Services Coordinator),” Wichmann said. 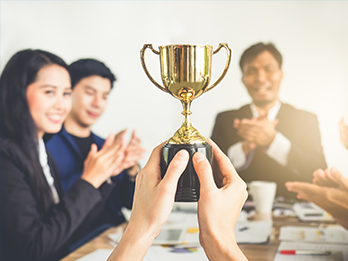 “We have one client in that program who Kathy was with the day she went to the hospital to have her first child – Kathy said goodbye to this same client, whose son is now in his twenties, when she left the program last spring.